How are strawberries harvested, by hand or by machine--learn the answer here. The vast majority of strawberries are harvested by hand-picking. Hand-picking is done mostly for market sale of the fruit. In this case, those who harvest the berries are typically paid primarily for the time they spend picking, or else by the amount of strawberries that they pick (which may be measured either by weight, or by volume). Hand-picking is also utilized on so-called "U-pick" farms. If you are the customer, then "you"-pick the berries that you want. 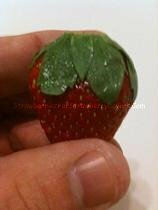 Many customers greatly prefer to get their strawberries in this way, since they have greater control over the quality of the fruit that they ultimately purchase. As for the owners of U-pick farms, they are typically paid by the customer according to the amount of strawberries the customer takes from the field (again, this may be measured either by weight, or by volume). U-pick farms are most common in the Midwestern and Northeastern areas of the United States, where matted row cultivation predominates. The conditions for those who do the hand-picking are often quite uncomfortable. The worst problem is how hot the strawberry fields can become. Since the strawberry plants in most areas produce the majority of their fruit during the spring and summer, strawberry harvesting is typically done in hot weather. There are some mechanical strawberry harvesters that have been developed, but they have had various problems. As a result, harvesting strawberries has remained labor intensive, which factors heavily into the cost of strawberries. rough handling of the fruit. Since mechanical harvesters pick strawberries indiscriminately, the timing of a harvest is critical, and harvesting must take place when the average ripeness of the fruit is acceptable. The fragile nature of strawberries is also a problem for many mechanical harvesters, with the fruit being bruised. For these reasons, the very limited amount of strawberries that have been picked by machines have been used almost exclusively for processed strawberry foods, such as jams and jellies.